firmly and irrevocably ensconced in the Marvel Universe. He got that way by accidentally slipping through a dimensional warp in the 19th issue of Fear (December, 1973), where The Man-Thing (a muck monster along the lines of Swamp Thing or The Heap) had been doing such things on a more-or-less continual basis. Unable to get back to the Duckworld, Howard was (to use one of his catch-phrases) "trapped in a world he never made". Sort of like The Shining Knight or J'onn J'onzz, Manhunter from Mars, but without pants. Howard's walk-on drew unexpectedly enthusiastic response, so he was brought back. He got a series of his own in the back pages of an extra-large comic devoted to The Man-Thing (titled Giant-Size Man-Thing, if you can imagine a major publisher putting a title like that on the newsstand). He'd only been in two issues (#s 4 and 5, May and August, 1975) before the title was cancelled. But with a January, 1976 cover date, Marvel gave him his own comic. Such was Howard's success that his creator, writer Steve Gerber (who had come up with him, he later claimed, only because he needed a visual to top a barbarian emerging from peanut butter, which he'd already used) sued Marvel Comics for him. Gerber (who also created Omega the Unknown and Thundarr the Barbarian) claimed his contract didn't give them sole ownership of ancillary characters he created for their stories. The suit was eventually settled (exact terms undisclosed, tho Marvel did wind up owning the character), but it left a mark on comics. Destroyer Duck, published by Eclipse as a benefit comic for Gerber's end of the lawsuit, contained the first appearance of Groo the Wanderer. That wasn't Howard's only lawsuit. 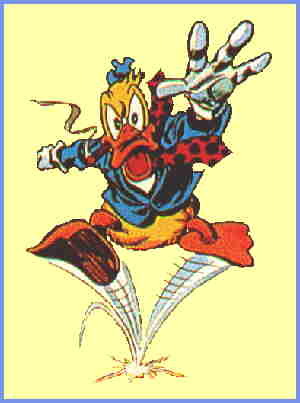 Disney threatened to sue Marvel too, alleging that Howard was too close a copy of Donald Duck. That one didn't go away until Howard started wearing pants, to distance himself from Disney's foul-tempered fowl. For an in-story explanation of the new look, Gerber had Howard sued for public indecency by a guy named Wally Sidney. Howard's regular comic book lasted until 1979, then the character, whose adventures had taken a somewhat adult turn, was moved out into a black and white magazine, and that extended his run another two years. During this period, he even had his own a newspaper strip, written by Gerber and drawn by Gene Colan (who also illustrated most of Howard's comic books). In one comics series or another, he met the rock group Kiss, briefly became a member of The Defenders, took on the persona of The Son of Satan, and did any number of things most funny animals would never dream of. In 1976, as the nominee of the All-Night Party, he ran for president, joining Pogo, Betty Boop and Alfred E. Neuman as a toon aspirant to the Oval Office. Eventually, tho, his popularity waned — and the fact that Gerber, following the lawsuit, no longer wrote the character, didn't help a bit. By 1986, Howard would probably have been just a memory — if not for the major motion picture produced by George "Star Wars" Lucas, which was released that year. The movie is widely regarded as a prize turkey, but it did propel Howard back into the public eye. Since then, a number of specials, back-up stories and guest appearances with other Marvel characters have kept him at least peripherally there. In 1996, Gerber was simultaneously writing a crossover between Howard and Spider-Man, and another for Image Comics (Witchblade, The Maxx), between Destroyer Duck and Savage Dragon. He included a very action-packed and rather confusing scene in each comic, that could, if you look at it right, be seen as having happened in the same place and at the same time. When the dust cleared, there was one more duck than there'd been before. Leonard the Duck, the one who walked away from that scene with Destroyer and Savage, is exactly like Howard in every way except one — this character is wholly owned by Steve Gerber.